Clay Tucker-Ladd was born May 12, 1931 to a 16-year-old mother and a farm hand father. At age 11 he began doing farm work during the summers; worked in a factory at age 16, then painted during the summers until 18. A serious student in a small rural school, he attended Miami University on a NROTC scholarship, graduating with honors. Later, he served with the US Marines in Korea creating a social conscience. He was married at age 21, yielding four natural children plus a foster daughter. 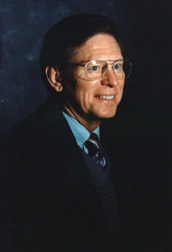 Resuming his role as a student he attended the University of Iowa, resulting in a Ph.D. in Clinical Psychology in 1960. Clay got his first professional job at Indiana University Medical Center training psychiatrists, later to become the Chief Psychologist of the Outpatient Psychiatry Clinic. He went to Southern Illinois University as Director of the Counseling & Testing Center. There, in 1970, he started teaching a class in how to apply psychology to personal life. In 1973 he wrote the first draft of Psychological Self-Help. He became chair of the Psychology Department at Eastern Illinois University from 1974 (to 1980), where he developed a Paraprofessional BA degree program while continuing to improve his self-help course. Divorced and remarried, Clay gained two step-children and an adopted son. Teaching full time from 1980, he retired in 1991. During the 1990's, Clay has maintained a small private practice, run some groups, and continued expanding and improving Psychological Self-Help. The book was finished and accepted for publication by Mental Help Net in 1996 and put online in 1997. Since publication, Clay has been busy updating the book, adding hundreds of psychology Web Sites, and responding almost daily on the Self-Help Forum. Clay passed away in early 2010. Dr. Clayton E. Tucker-Ladd has been licensed as a Clinical Psychologist by the Illinois Department of Professional Regulation for 34 years (License no. 071-001073). Phone and Web site for verification: 217-782-0458 and http://www.dpr.state.il.us (use Ladd for the last name). Address: PO Box 7086, Springfield, IL 62791-7086. Dr. Ladd has also been registered for many years with the National Register of Health Service Providers in Psychology, http://www.nationalregister.org Verification (15474), using Tucker-Ladd, is possible through that database search. Clay passed away in early 2010 and no longer maintains or updates the book. However, this website will remain online as a tribute to his life's work.